Since February 14 is heart’s day, I decided to make a dish that is good for the heart, for our Valentine’s Day dinner. For the main dish, the first thing that pops up to my mind is fish. Since it’s a special day, I decided to use a fish that we seldom eat which is yellowfin tuna, also known as ahi tuna to some. I like to put lemon juice and other ingredients to the yellowfin tuna but unfortunately I haven’t seen any lemon in the market, therefore, I just settled on searing the tuna with salt and pepper. For the side dish and appetizer, I couldn’t think of anything to match with the tuna but vegetables. It’s also good for the heart so it will be a good match for our heart’s day dinner. Good thing there’s a lot of packed pre-cut mixed vegetables in the market and that will save me time and also money. I used grilled eggplants and fresh tomatoes for the appetizer then, I added mayonnaise with hardboiled egg. So here’s my good for the heart meals for our heart’s day dinner. It’s simple and nutritious. It’s not only heart healthy but also budget friendly. Try it out and tell me what you think. Season yellowfin tuna with salt and pepper. Sear tuna on medium to high heat for 3 - 5 minutes each side. Set aside. Slice eggplants into 1/2 inch thick crosswise. Season with salt, pepper and oil. Mix to distribute evenly. Grill for 3 minutes each side. Set aside. Slice fresh tomatoes crosswise. Set aside. Mash hard-boiled egg and mix in mayonnaise. Assemble appetizer by placing eggplant at the bottom. Place tomatoes on top then mayonnaise mixture. Garnish with chop green onions. Wash mixed vegetables thoroughly and inspect for any damages. Heat oil in a pan and stir fry carrots, cauliflower and green beans for 3 minutes. Mix in cabbages and chayote then stir fry for another minute or until the cabbages is wilted. Season with Aji Ginisa. Arrange everything on a plate then serve and enjoy! For more recipes please visit Houselements. 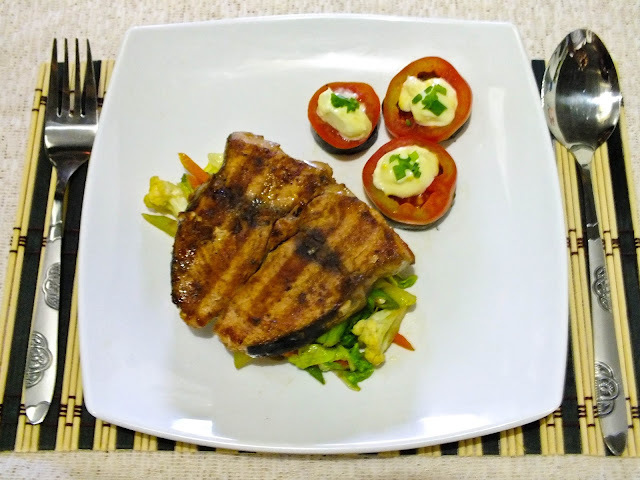 Check out the original post here Pan Seared Yellowfin Tuna with Mixed Veggies and Appetizer.